Satisfy your inner culture vulture at Chenrezig Institute and Tweed Regional Gallery & Margaret Olley Art Centre. Popular historic sites such as Caloundra Lighthouses and New Govardhana Australia are in your itinerary. 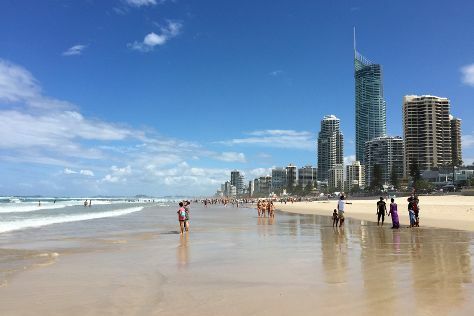 Explore Brisbane's surroundings by going to Surfers Paradise (Ripley's Believe It Or Not! Surfers Paradise, Surfers Paradise Beach, & more), Main Beach (Anthea Polson Art, Sea World Theme Park, & more) and Caloundra (MaisyMoo, Bulcock Beach, & more). Spend the 31st (Wed) exploring nature at Glass House Mountains National Park. Spend the 20th (Tue) exploring nature at Natural Bridge. There's still lots to do: look for all kinds of wild species at Lone Pine Koala Sanctuary, admire the masterpieces at Gallery of Modern Art, examine the collection at Mapleton Observatory, and get to know the resident critters at Australia Zoo. For traveler tips, more things to do, ratings, and tourist information, use the Brisbane trip maker website . If you are flying in from China, the closest major airports are Brisbane International Airport and Gold Coast Airport. In July, daytime highs in Brisbane are 24°C, while nighttime lows are 11°C. Wrap up your sightseeing on the 29th (Thu) to allow time to travel back home.